Hey there photo art aficionados!! 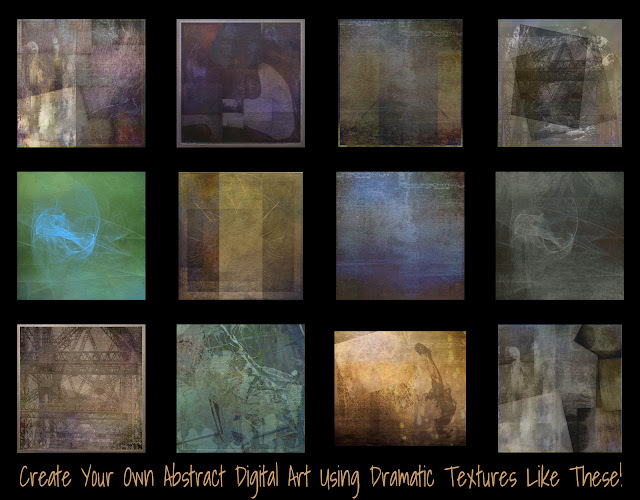 I'm excited to tell you about my latest texture creations designed to help you create your own digital abstract art. While nuanced textures designed to add a bit of distress or to give an vintage look to our prized photographs will always take the dominant place in our texture archives, how about some textures designed as jumping-off points for real abstract art? These new textures are little mini works-of-art in themselves, and although you can use them on a personal basis simply to print and hang on your own wall, I carefully created and tested them for you to use as graphic image components to help in the creation of your own abstract photo art. Since these new textures are not your run-of-the-mill slightly scratched, smudged, wrinkled, desaturated textures (yes, I make those too! ), they do have a slightly higher price point. But they are amazing value for the price. Do check them out in my new Abstract Art Textures shop. I will soon post examples of abstract art I have made using these textures. oh some really interesting texture plates there Bonnie; looks like you've been real busy creating these. Great colours. These look quite different and interesting... art-form in their own right. I will be taking a closer look and can't wait to see how you use them. Apologies! Link-up now for Photo Art Friday!!! Addendum re: Next Week's PAF & Two Freebies! Seems It Is Fav Photo Week!